Execution of a pod and rail table from CNC-machining centres, especially for the clamping of solid wood. 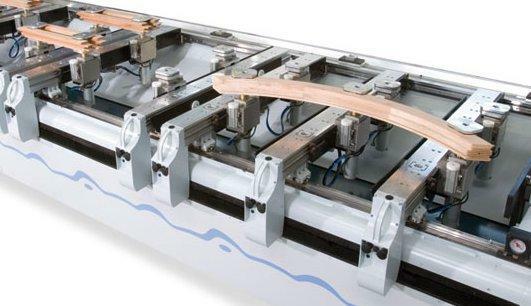 In the solid wood area there are many different shapes of workpieces that are hard to clamp on conventional pod and rail tables by using suction cups. The reason is that there are the high cutting forces, but there is only a limited availability of the contact surface for the clamping via vacuum. An increase of the vacuum pump's suction power (in contrast to the eg nesting technology) has only limited value, because the maximum holding pressure can be equal to the atmospheric air pressure. Examples for such workpieces are small parts, moldings, window frames, partly also stairs. Many manufacturers therefore offer mechanic clamping systems beside the vacuum clamping that additionally hold the workpiece. These can be positioned on the conventional pod and rail table (for example Uniclamp). 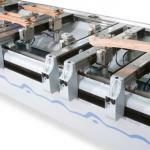 The consoles of the PM table are designed especially for the use of mechanic clamping systems. They are reinforced and offer lateral infeeds, where mechanic clamping elements can be mounted and moved easily. An advantage of the lateral attached clamps is the much stronger holding power in comparison to the clamps that are fitted on the consoles and as well the larger available working height. Furthermore, the supply of supporting energy and control signals (eg for automatic reclamping) is easier. The PM-table can be equipped with a Rüstautomatik (readying machine), at which only the console will take action contrary to the AP-table.